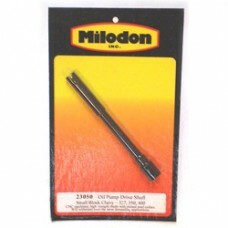 Milodon oil pump drive shafts are CNC machined from 4130 chrome moly and centreless ground to avoid stress risers. These race proven shafts eliminate breakage prone stock units that frequently fail when used with high volume oil systems, heavy racing oil and high RPM use. Ends are induction heat-treated to reduce wear. Good insurance at a low cost – no matter what the application. Shaft uses pinned steel collars instead of plastic. Designed for Small Block Chevrolet. See HD Oil Pump Drive Shaft from Federal Mogul FM224-6146E if no stock available.